Why Are Security Structures So Important for Businesses? Security structures are a critical element when it comes to protecting businesses. What can all the options do for you? Keeping your property secure is a necessity to protect your assets as well as for the safety of employees and visitors. Neglecting to properly secure an area could come at a cost to your bottom dollar or, worse yet, to your personal safety. It’s become a standard for businesses to install security strctures—everything from bollards to louvers included—but why is that the case? Security structures are a necessity for businesses and we aim to clear up some details surrounding the issue. By adding security structures to your property, you are taking basic steps to secure your property. This is important because a physical structure is one of the easiest ways to add a barrier of security without breaking the bank. While there are other important elements to a security plan like access control systems or CCTV systems, actual structures are an easy way to make a sense that the area is secure. Adding an extra level of security is easy to justify when you know how much safer it makes your property down the line. Not only do security structures physically make you safer, but they lend to a professional aesthetic that lends itself to your brand’s image. People will walk past your property and immediately realize that it’s a commercial facility that takes itself seriously. Security structures such as fencing or louvers are great ways to improve the overall aesthetic of a property, especially with all the customization options out there so you can find something perfect for you. Some worry that security structures are just too expensive of an investment to make. However, remember the return-on-investment you get by securing the property, as well as the fact that you can worry less about theft or vandalism being a problem. There’s a huge number of different options out there, too, meaning there’s something out there to fit any budget. 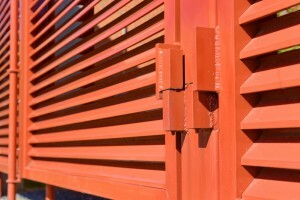 Custom louvers and fences can be inexpensive but still offer a huge amount of security for your dollar. This entry was posted on Friday, February 8th, 2019	at 4:28 pm	. You can follow any responses to this entry through the RSS 2.0 feed. Both comments and pings are currently closed.